Aunque hoy no lo parezca, el verano ya está a la vuelta de la esquina y ya tenemos que empezar a pensar en cuales son los accesorios más cool que no pueden faltar en nuestro bolso de playa. Haciendo el “check list” tenemos claro que el protector es un básico, más en estos tiempo en que la capa de ozono no nos está protegiendo mucho, el sombrero ya viene siendo desde hace varios veranos otro compañero infalible, pero sin duda un accesorio sin el cual no podemos vivir en la playa y nos previene de esas tan odiadas “patas de gallo” son las gafas. Pero este verano, a parte de las gafas de madera que ya les comenté en un post anterior, sin duda la gafas “must have” son las de efecto espejo. En las últimas semanas y cuando ya el sol se está haciendo cada vez más presente, nos han ido invadiendo este tipo de gafas, y ya no sólo vemos el clásico modelo de las Ray-Ban Aviator, sino que también este tipo de lente se ha apoderado de otros modelos, así que sin más, aquí les dejo las opciones que hay para que ya vayan eligiendo cual será su modelo fetiche para este verano!! Summer is around the corner and we have to start thinking about which cool accessories can’t miss in our beach bag. Doing a quick check list we have clear that a good sun screen is a must, specially in these times where the ozone layer is not protecting us that much, a hut has also been lately another best companion in summer days , but without any doubt an accessory that we can not leave without in our beach days and that prevent us from those awful “crow’s feet” are a good pair of sunnies and this year, besides the wood ones that I already show you in a past post, the mirror effect sunnies are the chosen ones. 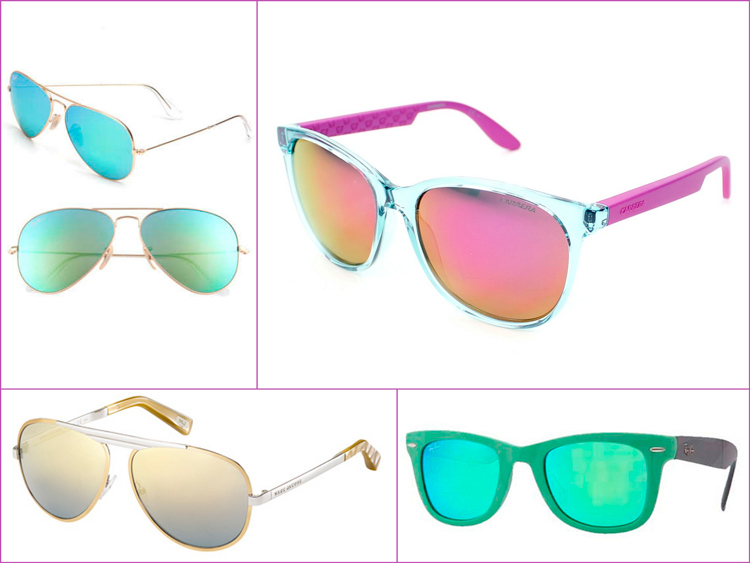 During these last weeks and now that the sun is getting stronger we have seen everywhere how the mirror sunnies are a trend, and we do not only see them in the classic Ray-Ban Aviator model but we have also seen how they have manage to conquer all types of sunnies, so…here I leave you with some options in order for you to decide which one of these will be your fetish model for this summer! Que horror!! Me acabo de dar cuenta que tengo otra cosa más que agregar a mi súper “wish list” veraniega que cada día se hace más extensa!! OMG!! I just have realized that I have another thing to add to my super summer wish list. This list is growing bigger every day!! Y ustedes?? Ya tienen un par de gafas de este estilo? Que les parecen? Qué modelos les gusta más? And you? Do you already have a pair of sunnies like this? What do you think of them? What model you like the most? Fotos / Images: The Blonde Salad, Gala Gonzalez, Lady Addict, Bittersweet colors, Little Prp, Lisa Place, Cashmere in Style, Something in the Way, Trendy Taste, Eat Sleep Wear, Viva Luxury, Style Scrapbook. Yo tengo las mias…pero no de espejo! Buuuuuuu! It remind of Frida Kahlo, I love it but I don’t think I can pull it off.